Last night we had a great time continuing our Google Plus Experiment by hosting and joining in a Hangout. And I have to say that I’m even more pumped and excited as I was before about using the social network to share concert stories and connect with you, my fellow live music fans. As we told you during our Lollapalooza podcast episode and concert fan tribute, we had the pleasure of meeting Steven and discovering a few of the details about his gate-crashing story as we headed into Lollapalooza this year. And last night during a Google Plus video Hangout we had the chance find out more of the inspiring and creative back story of what happened before and after Lollapalooza, and more about Steven’s concert experiences which involved seeing and being in a Flaming Lips video and seeking in to see the Wu-Tang Clan at SXSW 2011. We’ll be sharing Steven’s full story on a future episode of Live Fix Radio so keep your eye out for that episode because what he told me had me smiling and shaking my head in amazement and I have a feeling you’re going to really enjoy Steven’s story too. I always get excited when I have the opportunity to talk with other fans about their experiences and I have to say this Hangout test run that included me, Steven and Colleen was a perfect primer for our plan to have regular Hangouts with concerts fan where we talk about our live music stories and other concert topics. And I’ll tell you how you can join us in a moment. But first, let me tell you what else happened last night. Immediately after our time with Steven we jumped right into a other “open mic” Hangout hosted by musicians Heather Fay and Cat Beach. This experience still has been buzzing this morning because it allowed us to continue our virtual concert experiments. And what I love the most about this open mic Hangout (photo above) was that it was intimate, friendly, communal and totally spontaneous, which are all qualities I’ve enjoyed about most of the concert-focused Hangouts I’ve been a part of. 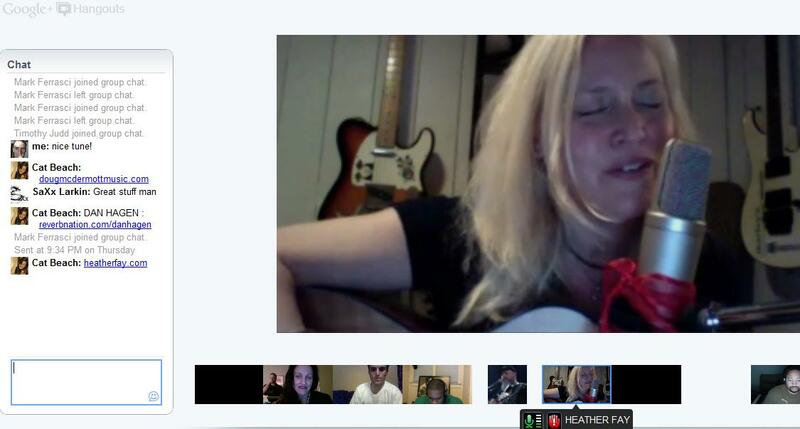 You can find out more about Fay’s virtual “open mics” nights at Hangoutparty.com. It’s in these types of intimate online live music settings that I think bands have the greatest opportunity to create powerful connections with fans before, during and after the show. And these types of virtual mini-concert experiences are also great for creating valuable connections with other bands and promoters to build a strong support system, especially when it comes time to tour and collaborate on future albums. Right now it appears that Hangouts are limited to about 10 people, but it seems that some Hangouts can hold more people or they be configured differently for larger audiences, especially when it involves a band or musician. I say this because the Black Eyed Peas recently hosted the largest pre-show Hangout to date with their NYC concert on Sept 1st, that raised over 4 million dollars for charity. And here’s a 3hr plus video that captures the event. After our Oprah Flash Mob Experiment we’re not surprised that the BEP’s are early adopters on Google Plus and we’re looking forward to seeing what they and other bands will offer fans i n the future. How Can You Join Our Experiment with Google Plus? As we mentioned before, we’ll be hosting more Hangouts about Emotions, complaints, Dancing Guys and other popular Experiments we’ve done, and we’d love to have you join us. Google Plus is now open to everyone and all you need to do is sign up here. Once you’re set up go ahead and find me on Google Plus, and then add me to your circle. Be sure to drop me quick note letting me know you’d like to be involved in the next Live Fix Hangout. Until then, I’d love to hear what you’ve been experiencing on Google Plus so let me know what you think in the comments below and we’ll share your story on future episode of Live Fix Radio.